I’ve reached that stage in my writing career where business cards come in handy. Going to cons, sending contracts, mailing in hard copies of subs — these are but a few of the opportunities we have to share our professional details. So I put some together a few months ago, simple things that were meant to look like the pages of a book, but when they came back from the printer’s I was disappointed. They just weren’t quite what I’d had in mind… so I ditched them, because, well, ew. Plot: BF conspires with DE and AWW to secretly create a set of fabulous business cards the likes of which I could not imagine. Deals were struck, magic was worked, and beauty was brought to my mailbox in card form. And behold! CLOCKWORK OWLS!!! Fonts fashioned out of twigs!!! Quotes from mine own stories!!! 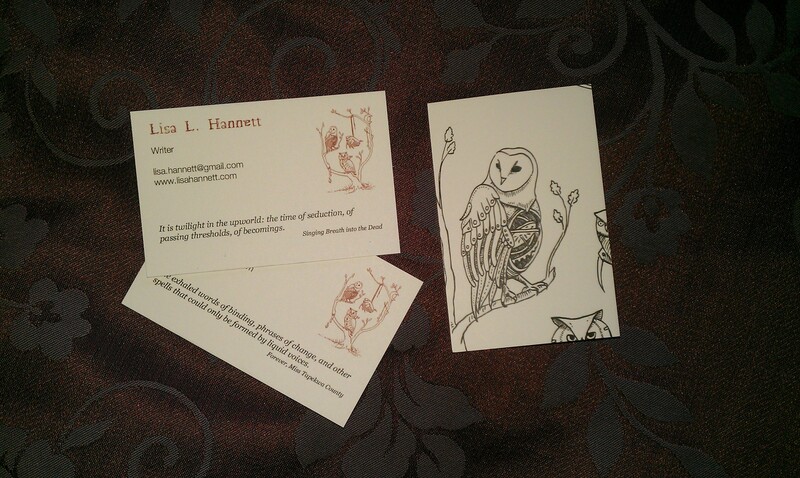 A treeful of mechanical owls graces the front of each card, and there are also various quotes from my stories (collect them all!) on each card. On the back, the awesome barn owl is featured. Thank you, thank you thank, dear Brain, Badger, and La Belle Artiste! Tags: angela slatter, bluegrass symphony, business cards, clockwork owls, david pollitt, kathleen jennings, spoiled rotten. Bookmark the permalink. Oh goody those came out rather well. I wasn’t sure if the peeking owls would be cut off or not. Lovely, absolutely lovely, Dr Hannett! Aren’t they just? I am a lucky girl! Very nice indeed. Do owls have a special significance for you?